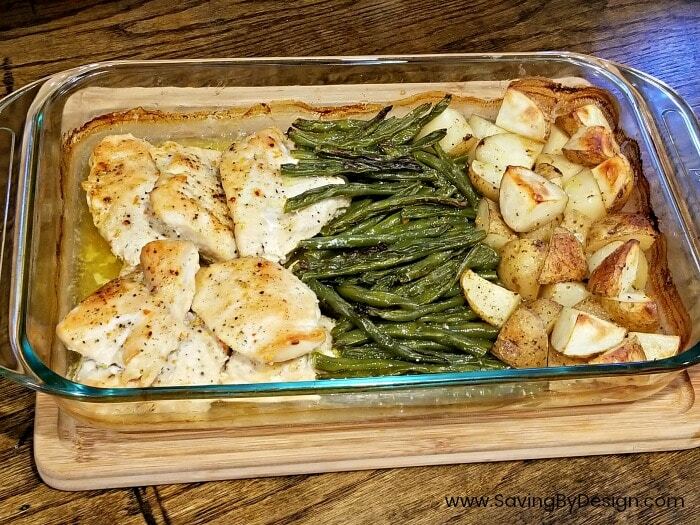 This One-Dish Baked Italian Dressing Chicken and Veggies is the perfect way to fit in a delicious meal on those super busy weeknights – no marinating needed! 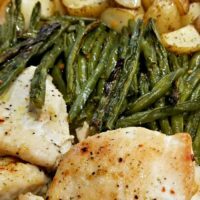 If your weeknights are anything like mine, you’ll love this Baked Italian Dressing Chicken and Veggies recipe! I know easy is best when it comes to family meals. But that doesn’t mean easy has to be full of processed food or limited to a drive-thru! 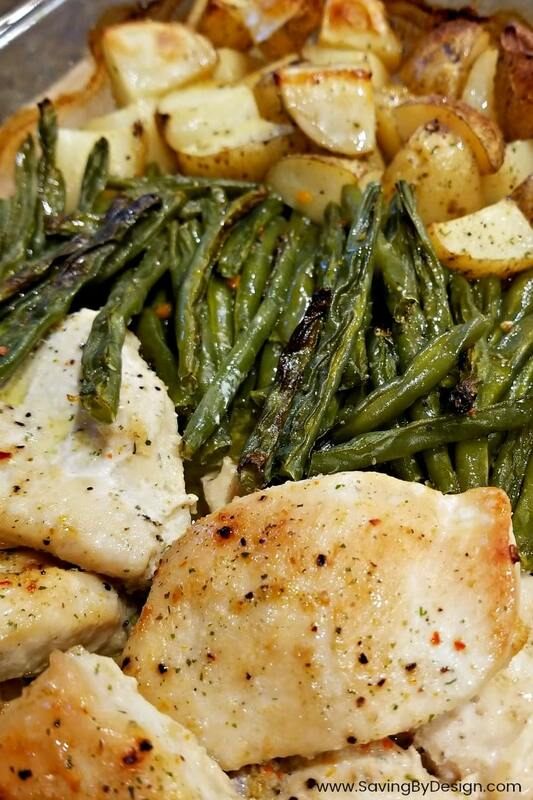 With just a few minutes of preparation and an hour of easy baking, you’ll have this delicious Baked Italian Dressing Chicken and Veggies on the table ready to eat before heading out the door to whatever activity is on your schedule that night. This chicken recipe is also easy to prepare ahead of time – with no marinating needed, you can get everything in your dish at a time that suits your schedule, season, and place in your refrigerator until dinner. Then just drizzle with olive oil and add the butter slices right before baking. 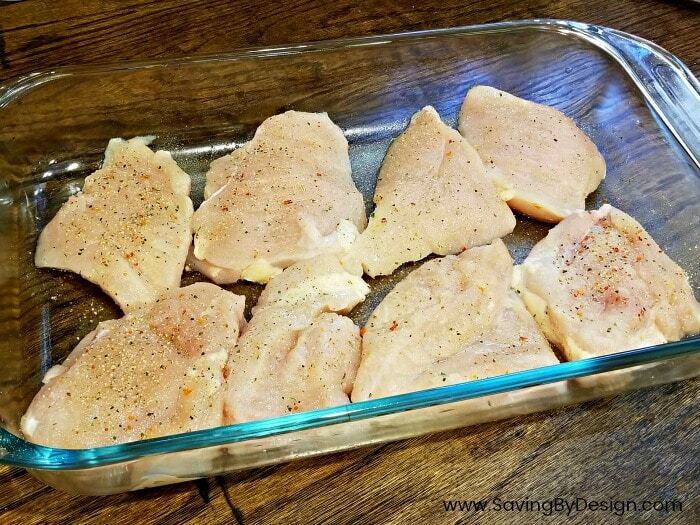 My kids just love this baked chicken recipe…and we do too! 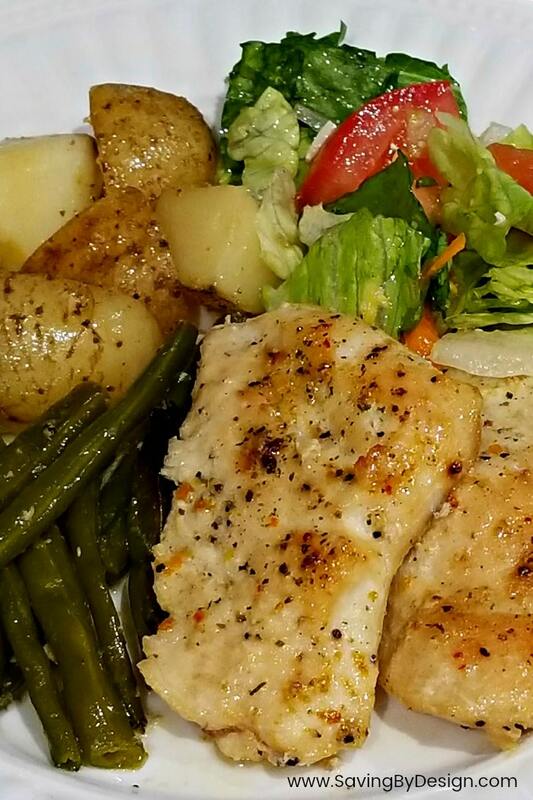 The chicken and veggies turn out cooked to perfection and perfectly flavored. In a 13 x 9 inch glass dish, I start by spreading out my chicken breasts. I like to either pound them or cut them in half so they aren’t too thick and are sure to get some good flavor. You can also use boneless chicken tenders if you’d like. 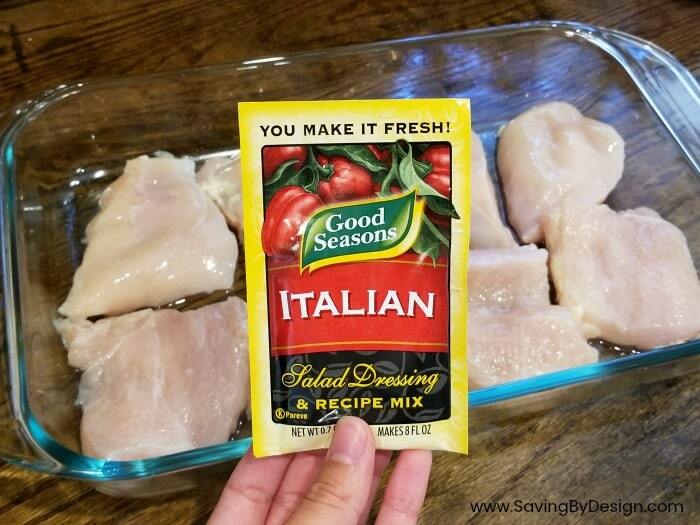 Season with salt, pepper, garlic powder, and the star ingredient – Good Seasons Italian Dressing. Season the chicken with about half the packet and save the rest for later. After seasoning both sides, place the chicken breasts into 1/3 of the dish. 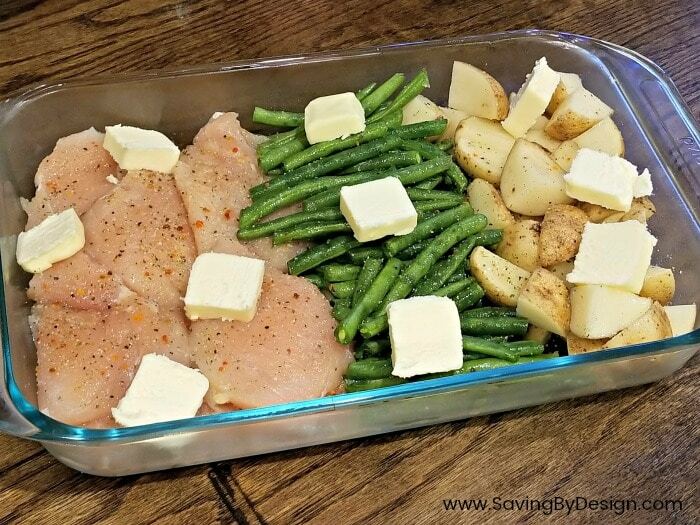 Add fresh green beans to the middle 1/3 of the dish and quartered potatoes to the last 1/3 of the dish. Sprinkle your remaining Good Seasons packet across the whole dish paying special attention to your veggies since they haven’t been seasoned yet. Finally drizzle with olive oil and scatter butter slices on top. Bake at 375 degrees for 45 minutes. Then turn up to heat to 400 degrees for an additional 15 minutes to give chicken and veggies a nice golden color. 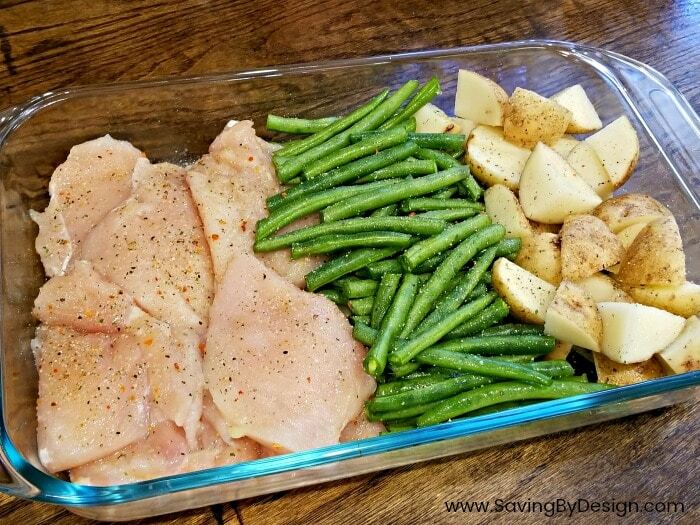 In a 13 x 9 inch glass dish, spread out chicken breasts to season. Season with salt, pepper, garlic powder, and 1/2 packet of Italian Dressing mix. After seasoning both sides, pile the chicken breasts into 1/3 of the dish. Sprinkle remaining Italian dressing packet across the whole dish paying special attention to your veggies since they haven't been seasoned yet. Drizzle with olive oil and scatter butter slices on top. You can also use boneless chicken tenders instead of breasts.